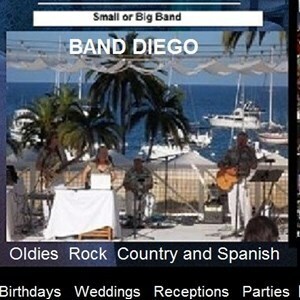 "Band Diego" offers San Diego California Oldies Band Music Entertainment. Timeless favorites for all ages. Male and Female musicians. Wide variety of vocals. Strong harmonies. Budget friendly pricing is easy to see online. Trios, Quartets, Quintets to Big Band Diego ten performers. Proud to be the fun San Diego's Entertainers! Party themes for: Birthdays, Anniversaries, 1950's, 1960's oldies Sock Hops, Rockin Summer Luau, Church Gatherings, Patriotic Honors, Country Hoedowns, BBQ Picnics, Festivals, Children's Parties, Reunions, Yacht Clubs, Golf Course Entertainment, Marathons, Mexican Food Fiesta with Spanish and English songs, Receptions, Birthday Bash, Romantic Serenade, Holiday Hits, Car Shows, Grand Opening, HOA Dance, Veteran Honors, Senior Dance. Have a celebration to remember! 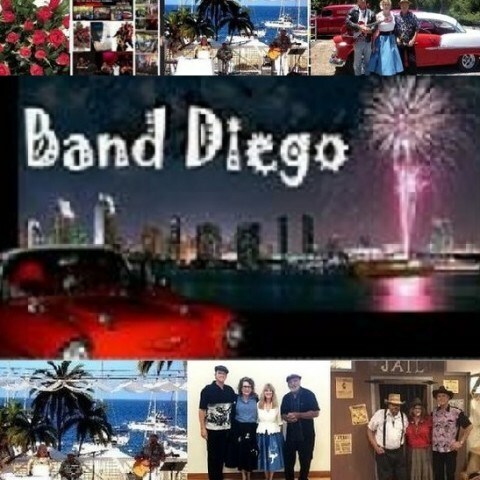 Live Band solution for San Diego Areas. Please visit the Band Diego web site for more information. Excellent reviews. For longer parties, there is a Variety Band with DJ option. To keep cost down, one musician doubles as the non-chatty background music dinner DJ. Rock? Yes they certainly do! Your guests will tap their feet to the spirit of the beat as they enjoy timeless favorites. Upbeat dance numbers will keep you moving, or slow down groovin. You can always count on Band Diego to perform the right music at the right moment! Male & female musicians. Party theme packages, small, & big band arrangements. Band package with background music non-chatty DJ for longer celebrations. Great pricing options from a small home party to large showcase production. Band Diego knows it is important for you to be able to choose the right entertainment for your party and works closely with your celebration program. The package that includes a background dinner music "DJ" with band option is popular for weddings and longer corporate celebrations that require non-stop entertainment. The bride and groom can custom pick songs and the DJ programs in advance of the special celebration. Performances are amplified. If you do not have electricity, the band offers a battery powered PA option or acoustic unplugged performance. (please inquire) Backing drum tracks are used with band sizes 2 to 5 performers. For bigger bands, 6-10 performers you can choose backing drum tracks or a live drummer. Please watch the video of the many styles the band plays. Tell Band Diego what you need, fun is guaranteed! Purchaser(s) of Band Diego entertainment shall provide parking for each entertainer as specified in quote, cover if rain, and a power outlet if entertainment is amplified. Purchaser shall pay for parking for band vehicles as required at party location. When purchaser wants Band Diego to use Public Parking, this is possible if parking is available within one block of party location. Purchaser is advised not to hire the band if no parking will be available. Per missing musician and reimburse purchaser the Band Diego fees accordingly. Band Diego Policy is no refunds. No reservation refunds. Insurances that might be required by purchaser's party location. Purchaser shall confine pets away from Performers and performer's gear. Gigmaster's. If purchaser is a business that requires invoicing, an invoice can possibly be arranged at Band Diego's discretion. (Please inquire). Band Diego pays the booking % Gigmaster's Fee where applicable. Travel charges shall be added if the celebration is out of San Diego County areas. Band Diego was very accommodating for a last minute book! They were awesome and we received lots of compliments! Thank you Band Diego and I look forward to working with you in the future! Band Diego was amazing, the guests loved them. Very organized specially since they had to bring the equipment over to Catalina, I feel Rhonda went above and beyond to make sure it was possible before agreeing to preform for my wedding. I would recommend them to anyone looking for a relaxed wedding envirnoment. We cannot say enough positives words for Band Diego. We booked them for our children's birthday/adoption party. They arrived on time, set up quickly, and started right on time. They understood exactly when to play, and when to take a break so hosts could make announcements. Their sound was wonderful! They are talented, professional musicians. Moreover, they were exceptional in getting the audience involved (which is what we wanted). One in their group is skilled at using a hoop to capture the audience's attention. The guests at our party expressed high regards for the band. We rate Band Diego an A+. Such a heart warming celebration! Band Diego was honored to be part of your well planned party. Your adopted children are blessed to have such a loving family and wonderful circle of Friends. Thank you for choosing Band Diego. We had a '50s Sock Hop Party for our residents and they absolutely LOVED them!! I've never had so many complements about they music until that night! They could not stop raving about them. They got all our residents involved in dancing and having fun playing with hula hoops. I will definitely be hiring this band again!!! Absolute BEST! Awesome experience with this band. Rhonda and John are great musicians! I planned on popping the question to my girlfriend and I wanted to surprise her by singing "Can't take my eyes off you" by Frankie Valli. Rhonda and John practiced with me and we're really nice and professional. When they day came, they were on time and on their A game! Very dependable. I proposed to my girlfriend that day and she said yes! Now she's my fiancée :D !!!! Thank you again, Rhonda and John, for helping make this a special moment. I highly recommend Band Diego! They showed up in a timely fashion. They gave us beneficial feedback on how to arrange the room for the best viewing, listening and dancing. They kept the volume at a level that was best for the room size and acoustics. They allowed us to use the mike for some announcements. Their choice of music fit our "beach party" theme. Good sounds and good dancing. I would highly reccommend them for your party! 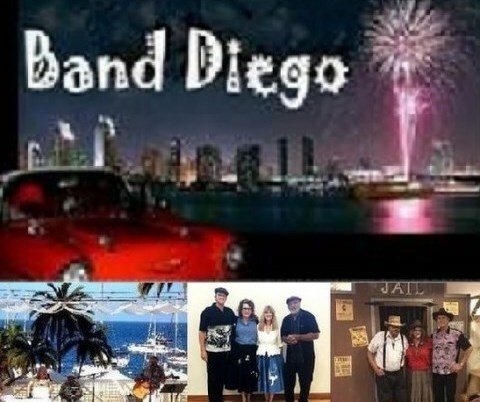 Please note Band Diego will also travel to Poway, Rancho Santa Fe, Escondido, Del Mar, San Marcos, Santee, Solana Beach, Cardiff By The Sea, La Jolla, Encinitas, El Cajon, Lakeside, Ramona, La Mesa, Carlsbad, Vista, Lemon Grove, Spring Valley, Oceanside, Valley Center, Alpine, Coronado, Bonsall, Lincoln Acres, National City, Bonita, San Luis Rey, Chula Vista, Pauma Valley, Jamul.